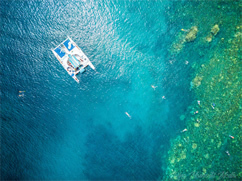 Based in Kaanapali on Maui, Sea Maui offers a variety of ocean adventures, including snorkeling cruises, sunset sailing and whale watch cruises. Choose from these fun Sea Maui tours below. Hop on board Sea Maui’s comfortable catamaran right on Kaanapali Beach and head over to the neighbor island of Lanai for a fun snorkeling adventure in waters teeming with marine life. 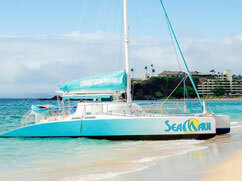 This snorkel sail adventure aboard Sea Maui’s catamaran departs from Kaanapali Beach. The captain will determine the best West Maui snorkel site to visit that day based upon current ocean conditions. If you’re not exactly a morning person, this Maui snorkel tour is for you! 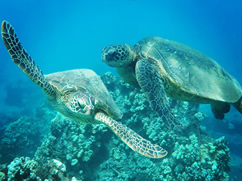 With an afternoon departure time and a duration of just two hours, you can take the morning to relax, then hop on the boat and snorkel at one of Maui’s best snorkel sites. 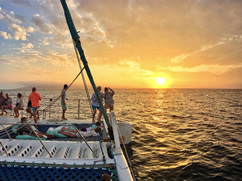 Come aboard Sea Maui’s modern catamaran and enjoy a sunset sail along the Kaanapali coastline. Enjoy scenic views of the West Maui Mountains and the neighbor islands of Kahoolawe, Lanai and Molokai.